These charcoal water filters fit into your coffee maker to filter out unwanted impurities in your water. If you care about the taste and quality of your coffee, replacing your charcoal water filters is a necessity! This are sure to help keep your coffee taste its best AND help keep your coffee maker clean. The days of weird tastes in your coffee from water impurities is over! We made sure to create the best charcoal filters we could by making sure they are very simple to use. 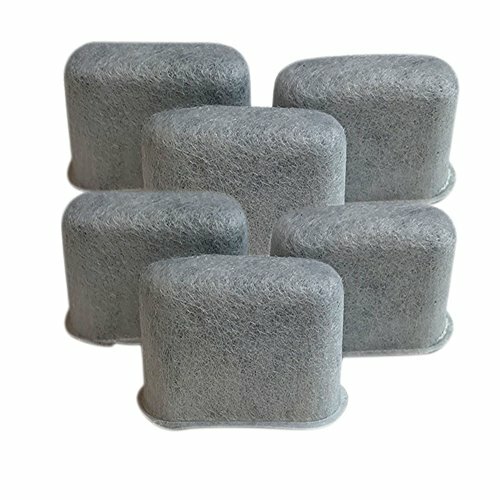 Charcoal filters can be a pain to replace when you remember to install them so we made sure we did our best to make the experience easier for you. You may notice cleaner water and better tasting coffee. This is a generic product designed and engineered in the United States by Think Crucial. This is not a Capresso OEM product and is not covered under any Capresso manufacturer's warranty. The Capresso brand names and logos are the registered trademarks of their respective owners. Any use of the Capresso brand name or model designation for this product is made solely for purposes of demonstrating compatibility. EXTREMELY DURABLE so when you insert your filter into your Capresso Capresso 4640.93, TEAM TS # 465 it doesn't break or cause you to purchase anything extra besides more delicious coffee! HEALTHIER LIVING because you're keeping the water you use for your coffee the cleanest it can possibly be. You can be a better you when you're healthier! PREMIUM FILTRATION when you drink out of your Capresso Coffee Maker 464 or 465. These filters can can filter out bacteria, unwanted contaminants, unpleasant odors and more. This way you get pure, great tasting coffee! INCREDIBLY SIMPLE TO USE because there is basically only one step! Take out your old water filter and insert this one into your Capresso Coffee Makers and you're all set!